A revolutionary laser treatment could save the sight of millions, British experts claim. The process is said to stop the onset of age-related macular degeneration, one of the commonest forms of blindness, which leaves victims unable to read, drive or live independently. 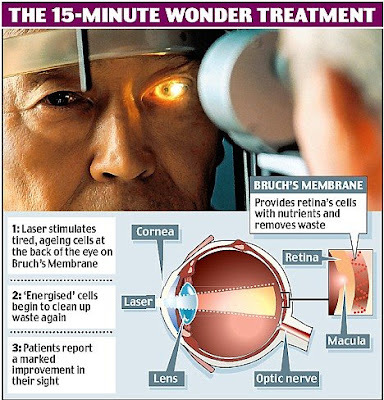 It can be carried out in just ten to 15 minutes by any ophthalmologist. While it does not cure sight loss, its creators say it could prevent a generation from having to put up with declining vision in old age. People with a family history of the disease could have pre-emptive treatment in their thirties. The technique is said to be safe and painless and could save the NHS millions of pounds in treating age-related macular degeneration (AMD). It could even stop the disease getting worse in existing patients. Medical charities welcomed the breakthrough but warned that it might not be available to the public for several years. AMD is caused by damage to an area about 5mm across at the centre of the retina called the macula, which is responsible for our central vision. The disease is the leading cause of blindness in the over- sixties, and around 200,000 Britons are registered as blind or partially sighted because of it. There is no treatment for the most common 'dry' form. The more aggressive 'wet' version, in which new blood vessels cause bleeding and scarring behind the retina, can be stabilised with drugs. The technique is the brainchild of Professor John Marshall, an ophthalmologist at King's College London who pioneered laser surgery to correct shortsightedness. The technique rejuvenates the 'Bruch's membrane' - a thin layer that lies behind the retina. This provides the retina's light-sensitive cells with nutrients and removes waste created as a by-product of the way retina cells renew themselves. But the membrane's cells eventually lose the ability to take waste away, allowing deposits to build up. It can then become so damaged that the retina's lightsensitive cells start to die off. In a trial involving more than 100 diabetics, Professor Marshall found that using a laser stimulated the membrane's tired, ageing cells into action. After the cells were ' energised' by the laser, they began to clean up the waste again. Patients also said the treatment led to a ' marked improvement' in their sight. The non-invasive operation uses a laser modified to give pulses of light that do not damage the eye's light-sensitive cells or cause any dangerous heating of the target area. He wants to see if the laser prevents the good eye losing its sight. 'If you can delay the onset by three, four, six, seven or ten years, it's proof of the principle,' he said.